Cavallini Decorative Gift Tags - These gorgeous gift tags are printed with vintage images from the Cavallini archives. 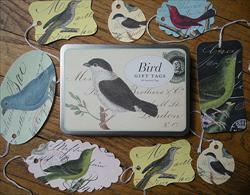 There are 36 tags per tin (6 sets of 6 designs), and the tins themselves are reusable. Each tag is pre-strung and ready to use. These are ideal for scrapbooking, card making, book making, collage, gift wrapping, and more. They are printed on one side and blank white on the other side.